FastScan™ ELISA kits – include all the items you need to measure key cellular signaling proteins. 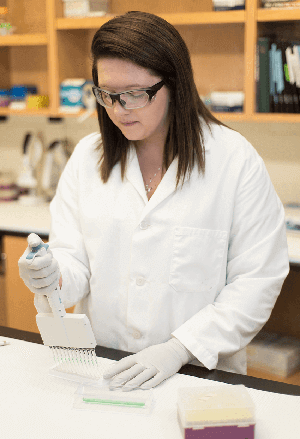 Simple protocols and a less complex, solution-based assay format lets you detect targets in as little as 90 minutes, much faster than conventional protocols. Kits are available for both phosphorylation-specific and total protein options and come with integrated controls. PathScan® Sandwich ELISA kits – include all the items you need to detect endogenous levels of key signaling molecules using a traditional, sandwich-based assay format. Matched phospho and total protein kits are available for many targets, as well as chemiluminescent and colorimetric detection options. PathScan ® Sandwich ELISA Antibody Pairs – provide an economical alternative to our complete ELISA kits, formulated for traditional, sandwich-based assay formats. Which CST ELISA Solution is Best for Me? Choosing the right ELISA solution is important, and we want you to get the absolute best results for your research project. Here’s a quick comparison of our FastScan and PathScan ELISA kits and assays to help you decide. 1 Other sample types may be compatible depending on specific kit. Samples must be prepared in such a way that they are compatible with immune reactivity. Figure: Comparison of Pathscan (left) and FastScan (right) ELISA assay methods. In the Pathscan ELISA assay method the capture antibody is pre-adsorbed onto the microplate well in advance. Sample, Detection Ab and a secondary HRP-linked Ab are each added serially with incubation and multi-wash steps in between each addition. The capture antibody binds to one site of the sample molecule, where the detection antibody recognizes another site, thereby forming the sandwich around the target. FastScan ELISA kits use a streamlined format wherein the antibody-target sandwich complex is formed in solution in a single incubation, requiring only one wash. The capture antibody, detection antibody and target sample are mixed and added to a microplate well. The entire complex is anchored to the well via an anti-tag antibody, which has been pre-adsorbed in the well. Figure: Comparison of Pathscan (left) and FastScan (right) ELISA assay methods. In the Pathscan ELISA assay method the capture antibody is pre-adsorbed onto the microplate well in advance. Sample, Detection Ab and a secondary HRP-linked Ab are each added serially with incubation and multi-wash steps in between each addition. The capture antibody binds to one site of the sample molecule, where the detection antibody recognizes another site, thereby forming the sandwich around the target. FastScan ELISA kits use a streamlined format wherein the antibody-target sandwich complex is formed in solution in a single incubation, requiring only one wash. The capture antibody, detection antibody and target sample are mixed and added to a microplate well. The entire complex is anchored to the well via an anti-tag antibody, which has been pre-adsorbed in the well. Our ELISA kits are also available in bulk quantities with a choice of either 96- or 384-well plates so you can customize them just for your lab. If you need a 384-well format or bulk packaging of 5 or more kits, please contact CST's sales department for processing time and pricing.